Scientism, simply put, was (and is) not only the belief that rationalism and empiricism were the dominant techniques of knowing, but also that such knowing could be entirely coherent, totalistic, and universally true. In this way, Gottschalk points out, scientism carried through the totalizing impulses of Christian religious systems of classification, endowing ideas deemed scientific with a universal authority that belied their historically and epistemologically particular origins. More specifically, scientism retained some of the same elements that characterized the medieval Christian classification of humanity, such as creating categories based on a particular essence believed to belong to different individuals, and insisting that each individual b elonged to one and only one category. The ideology of scientism gradually displaced the authority of “religion” in Europe. At the same time, in imperial territories, scientism began to define religion as the essential characteristic of non-Western populations, thereby distancing them from Europeans and from modernity itself. The main thrust of this book, then, is to explore the centrality of religion to the systems of disciplinary knowledge that were applied and developed in the subcontinent. We know these disciplines today as cartography, anthropology, demographics, ethnology, folklore, archaeology, and the history of religions. Gottschalk describes the co-dependence between these disciplines and the growth of imperialism, their distinctive quality in comparison with older European and South Asian systems of knowledge, and the formation of new systems of information (especially taxonomies) to serve them. It is this nexus between knowledge and power that has characterized much scholarship on colonialism and religion since the writings of Michel Foucault and Edward Said. Gottschalk summarizes the last few decades of that scholarship with great acumen. The next two chapters look at the disciplines of folklore, ethnology, and archaeology, paying special attention to museums and the memorialization of the past. Gottschalk shows how studies of folklore were predicated on a systematic ordering of the past, demonstrating the overlap between classification and narrative. Narratives about the past, moreover, frequently gave rise to teleologies, as much in humanistic ethnological accounts as in Christian travel writing. The ethnologist William Crooke, for example, mirrored many social scientists of his day in deriving from his studies of “folk” religion of northern India (the complex and compromised ethnographic methods of which Gottschalk details) a progressive narrative of religion from the primitive to the modern. These evolutionary metanarratives would continue in civilizational and biological formats, both of which contributed to “scientific” narratives of racial distribution, linguistic variation, caste origination, and religious formation. In the following chapter, Gottschalk provides an illuminating account of the history of the Archaeological Survey of India that demonstrates how historiographers differentiated themselves from local narrators of the past, in their scientistic trust in objective and universal methods. The final chapter takes Gottschalk to present-day Chainpur, to understand how or if these systems of classification have impacted local understandings of the town. Gottschalk finds a dialectic between British and nationalist historiographies and local memory, and holds up this tension to illustrate both the qualities and limits of scientism. Although at least one premodern narrative practice in Chainpur, the bardic tradition of performance, has been largely displaced, and schoolchildren learn the history of the nation through textbooks curated for them by a formal educational system, many continue to reconstruct the local past through inherited oral narratives. 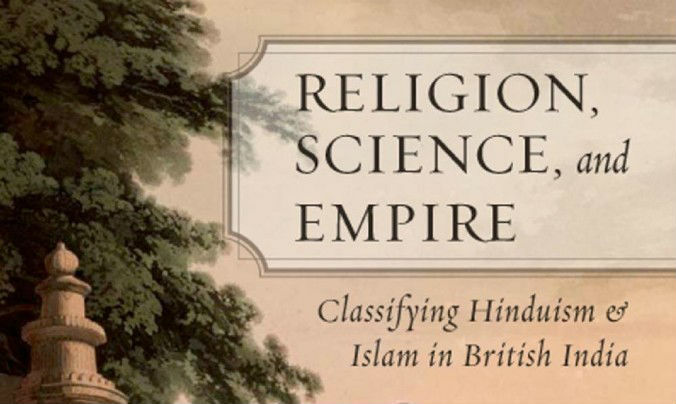 Gottschalk’s book explores the startling rise to prominence of scientific methods of classification, the centrality of “religion” to practices of knowledge-power in the subcontinent, and the hegemony that such totalizing disciplinary practices acquired in both British and Indian official discourse. His aim is, nevertheless, in keeping with the scholarship by which the book is inspired (including his own previous book, Beyond Hindu and Muslim), to question the categorical presumptions of universal classification. In a world where such identitarian formations seem to have become an inevitable feature of political and social life, Gottschalk offers a salutary reminder of their contingent histories. Anand Venkatkrishnan is a Junior Research Fellow in Classical Indology at Balliol College, Oxford. He received his PhD in South Asian Religion from Columbia University (2015). He also holds MA (2012) and MPhil (2013) degrees in South Asian Religion from Columbia, as well as BA in Classics from Stanford University (2010). Anand’s research interests include the intersection of religious movements and scholarly pedagogy, the social history of Sanskrit knowledge-systems, early modern South Asia, and Indian intellectual history more broadly. He also keeps a blog of Sanskrit poetry translations at http://apurvaracana.tumblr.com.